Cubicle farms give way to open-concept plans, but savvy designs include a variety of private spaces. Gone are the high-walled cubicle farms. These days, more companies are choosing to open up their office spaces by lowering or eliminating dividers in an effort to encourage collaboration and productivity. But is this open concept really better? Or does it mean, merely, that everyone hears each other’s conversations? Or that without walls, they no longer have a place to hang their coats? Is it possible to take the open concept too far and leave people begging for good old-fashioned doors? Finding this balance between collaboration and privacy is something that Amy Paron, the office manager at 98Point6, a rapidly growing health care technology company, is keeping in mind as they plan to build out an office for 150 employees in the Columbia Tower. Their main focus is on collaboration and it will have an open concept with all the employees, including executives, working side by side. But there also will be 23 meeting rooms of all shapes and sizes. Some will be small pods or phone booth-style rooms for one or two people. Others, like the Family Room, will have a collapsible glass door that expands into the kitchen to create a space big enough to hold all the employees for their weekly company meetings. Only one of the rooms has a boardroom style table; the rest are outfitted with comfy chairs, side tables and fluffy pillows. Throughout the office there are many places for people to gather, including multiple kitchens and several nooks outfitted with different seating options, bar tables and stools. All desks are adjustable stand/sit desks and a locker room is provided to encourage employees to bike to work or be active during the day. They also have games, beer and seltzer water on tap, and Paron says their coffee brewing is a finely tuned science that involves specially roasted beans from Vashon, coffee grinders and a very specific procedure. They are in Seattle, after all. So, go ahead and take down those walls. Open the space up. 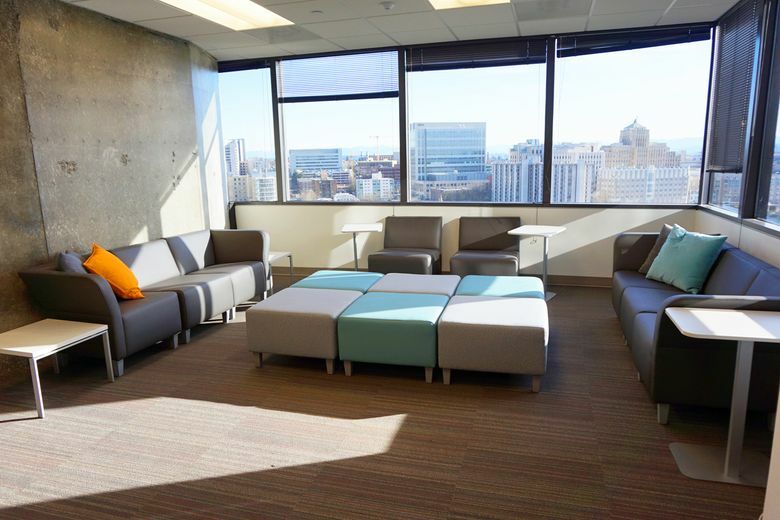 Put these new brighter work spaces along the perimeter where they can take advantage of the views and natural light. Encourage employees to work together. Fill the office with soft chairs and fluffy pillows. But, be sure to fit the space to the group. Think about the needs of each team. Tear down the walls that separate us, but make sure to build them back up where you need them. Ducky’s Office Furniture has been providing Northwest Washington businesses, schools, government agencies and the military with new and used furniture solutions and related services for over 30 years.